Good & Bad News for HandyDART – Action Needed Today! It has been an eventful few months since our last newsletter, with some significant good news for HandyDART riders. But we just got some concerning news and need your help today! • In September TransLink reported a HandyDART budget increase of $820,000 to fund 33,000 additional trips to meet increasing demand this year. TransLink reports that 90% of these trips are to be provided by HandyDART bus. This is only a small increase, but it is an important step in the right direction. • HandyDART Riders’ Alliance members Tim Louis and Patrick Maxcy have been appointed to TransLink’s “Custom Transit Service Delivery Review Stakeholder Advisory Committee.” This committee is providing input into options including bringing HandyDART in-house as a TransLink subsidiary. The HandyDART Riders’ Alliance has been working to make HandyDART a TransLink subsidiary or non-profit for years, as this is the only way to get efficient, safe and high quality service. • BC’ independent Seniors Advocate is doing a survey of HandyDART riders. 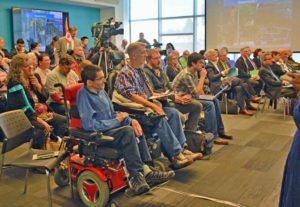 Half of the riders in the lower mainland will be surveyed, and the results will provide even more evidence that more and better HandyDART service is desperately needed. If you have received a survey, please fill it out today! • Provincial NDP leader John Horrigan has committed to funding the Mayor’s 10-year Transit Vision which includes a 30% increase in HandyDART service. This will help make transit funding, including HandyDART, a key issue in the May 2017 provincial election. None of this good news would have happened without people like you taking action and demanding better HandyDART service. • The growing population of seniors means the number of people with disabilities is increasing twice as fast as the rest of the population. HandyDART service must be increased to meet this growing need. • HandyDART must either be brought in-house as a TransLink subsidiary or turned over to a non-profit agency. Experience shows private corporations cost more and put profits above quality service. Taxis should only be used to satisfy a clients request for a ride when they are the only option. They are fast becoming a replacement for busses and are totally inadequate!